As researchers, we know how exciting it is when this axiom comes true, especially when a serendipitous discovery leads to breakthrough answers that can change someone’s life. In the field of multiple sclerosis, we have celebrated the development of 11 disease modifying therapies for people with relapsing forms of the disease over the relatively short span of two decades. Unfortunately finding effective treatments for progressive MS remains a daunting challenge. The urgent need to find answers for the more than one million people living with progressive MS around the world is what led to the formation of what is, for MS, an unprecedented international initiative – the Progressive MS Alliance. The goal of the Alliance is to speed the development of new treatments for progressive MS by funding the best research, wherever it exists. The Alliance is uniquely positioned to confront the challenges of progressive MS and is led with management from MS Societies in the United States, Canada, Italy, Australia, the United Kingdom and the MS International Federation, with expanding financial, scientific and resource support from these and other organizations, including the MS Societies and scientific communities of Denmark, Belgium, the Netherlands, Germany, France and Spain. In September, at the ECTRIMS/ACTRIMS meeting in Boston, the Alliance announced its first round of funding, awarding 22 grants in nine countries around the world. These first grants are short-term innovative pilot studies to begin filling knowledge and infrastructure gaps, such as identifying and testing potential treatments; understanding nerve degeneration; and building databanks and biobanks to better understand long-term imaging, genetics, and outcomes associated with progressive MS. These pilot studies have terms of one to two years and are the first step in a planned cumulative investment of €22 million (nearly $30 million USD) over the next six years. Teams of excellence: Teams must be comprised of at least three research groups in three countries. No one group, no matter how expert, has all the answers to a disease as complex as multiple sclerosis. Forming multi-team/multi-disciplinary labs will allow idea exchange across a variety of expertise areas to flow faster. Academic/industry networks: Encouraging academic research labs and industry partners to work together with the goal of moving from bench to bedside quicker is already shifting the research agenda of the entire MS field and placing a bright spotlight on progressive MS. Coordinated data sharing: At times, it can be a challenge to enroll sufficient numbers of people in clinical trials. Having trial sites in multiple countries at once will provide the opportunity to enroll diverse populations and collect large data samples more efficiently and expediently. This RFA is not intended to solicit typical investigator-initiated research grants – it is designed to bring together experts in a number of disciplines to focus on overcoming the most significant barriers to the development of effective treatments for progressive MS.
Providing teams the resources they need – up to €1 million per year – will have a tremendous impact on their potential for success and means that researchers can focus on finding answers, rather than looking to piece together funding. The Progressive MS Alliance is encouraging – and challenging – the research community to be bold, think differently, act globally, and bring their best ideas forward. With collaboration and creative thinking we will find real answers for people living with progressive forms of multiple sclerosis. Visit progressivemsalliance.org to learn more. 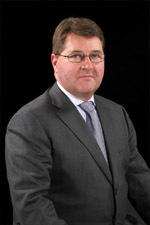 Professor Alan Thompson is Chair of the Alliance’s Scientific Steering Committee and Dean of University College London’s Faculty of Brain Sciences.